Termites are tiny, colony-dwelling insects and are known for their ability to devastate materials made from cellulose. 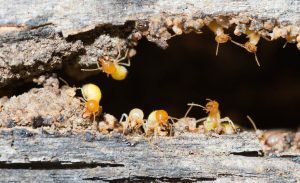 The signs of termites are hard to detect, and as a result, most home and business owners are not aware of infestation until major structural damages occur. Properties in Greensborough are at a risk of termite infestation, so it is important to schedule a termite inspection to control the pest problem before it turns out to be a major issue. The exterminators of M&R Termite Solution specialise in termite control, and are trained to eliminate colonies using eco-friendly methods. Our termite inspector will look for the signs of termites and provide a complete report on the extent of infestation. We adopt non-toxic pest control methods and use safe termite treatment products to achieve 100% termite control. Our certified professionals will go an extra mile to ensure a safe and healthy environment for all of our customers. To determine whether your property is infested by termites or not, you can speak to one of our professionals at 0413716233. We will offer a free estimate and schedule an appointment to visit your home.